2018 Barihunk Calendar model Edwin Crossley-Mercer will be performing at Suntory Hall in Tokyo on December 22nd along with soprano Marina Monzó and Dmitry Korchak. Joined by the Tokyo Symphony Orchestra and The Little Singers of Tokyo chorus, they will perform holiday favorites, along with some greatest hits from opera. Tickets are available online. On January 28th, he will find out if the album "Mademoiselle: Première Audience - Unknown Music Of Nadia Boulanger," which he perform on, will win the 2018 Grammy Award for Best Classical Compendium. He also recently released a recording of Lully's Alceste with Christophe Rousset and the Les Talens Lyriques. Early in 2018, he will be releasing two CD's, one with songs to texts by Oscar Wilde and another to texts by Cody Franchetti. The 80-minute Wilde song set will be premiered this summer in Paris. If you want to catch him live in an opera, he'll be performing Leporello at the Municipal de Santiago in April with Levent Bakirci in the title role and bass-barihunk Solomon Howard as the Commendatore. In the summer, he heads to the Bayerische Staatsoper in Munich for Haydn's Orlando Paladino. ONLY 10 DAYS LEFT TO ORDER our 2018 Barihunks Calendar, which includes 20 of opera's sexiest men is now available for purchase HERE. In response to reader demand, we've also added a Barihunks Photo Book this year, which includes additional photos that don't appear in the calendar. You can purchase that HERE. The New Year is approaching faster than you think. Barihunk Iurii Samoilov will receive the Ottomar Päsel Prize after today's performance of Mozart's Cosi fan tutte in which he's singing Guglielmo. He is the first member of the Ensemble at Oper Frankfurt to have received the award. The ceremony will take place tonight in the Holzfoyer of Oper Frankfurt after the performance. After today's performance, he has remaining shows on December 17, 20, 22 and January 1st. In between performances, he heads back to his native Ukraine for a holiday concert at the Lviv Opera House on December 24th, which includes works by Ukrainian composers, as well as Puccini, Bizet, Mozart and Saint-Saëns. ONLY 14 DAYS LEFT TO ORDER our 2018 Barihunks Calendar, which includes 20 of opera's sexiest men is now available for purchase HERE. In response to reader demand, we've also added a Barihunks Photo Book this year, which includes additional photos that don't appear in the calendar. You can purchase that HERE. The New Year is approaching faster than you think. Happy Birthday, Ludwig von Beethoven! Beethoven remains the single most influential figure in the history of Western music, having composed some of classical music's most lasting and popular pieces, including nine symphonies (in particular the Eroica, the 5th, 7th and 9th (with it's famous Ode to Joy), the opera Fidelio, Missa Solemnis, many of the greatest string quartets ever written (including the classic String Quartet No.14), five piano concertos (capped by the popular Piano Concerto No.5), Piano Sonata No.30, the Coriolan Overture, Violin Concerto in D, the Kreutzer Sonata and many more! Beethoven was born in Bonn, Germany on December 16, 1770. His father was a court musician who had hopes of making money by exploiting his son as a child prodigy. At the time, Vienna was the place where any German or Austrian musician had to go to acquire a reputation, and it's where Beethoven landed, just a year after Mozart's death. Beethoven had previously visited Mozart in Vienna and had hoped to study composition with him, but ended up studying with Haydn. Beethoven's music has become a testament to the human spirit in the face of cruel misfortune. His 32 piano sonatas, which he wrote in bursts throughout his career, experiment with form in all directions, using the full expressive range of an instrument that was itself changing rapidly, growing louder and with an ever greater range of notes. His songs have not gained the popularity that his other works attained, possibly because his emotions came out in the piano parts rather than the vocal lines. Nonetheless he left us the glorious An die ferne Geliebte song cycle, the six Gellert settings, folksong arrangements and, perhaps his greatest song, Adelaide. Adelaide was composed in 1794 or 1795 and was the composer's favorite song, which he played in an 1815 concert in celebration of the Empress of Russia's birthday. Adelaide is structured like a sonata in miniature, with a middle passage that goes through several keys. The first verse of the setting, for example, in which the poet describes wandering in a garden during a spring night, is tranquil; in the second, when he describes seeing the face of his beloved in the grandeur of nature, the music is far more stately; in the third, the piano vividly depicts both rushing waves and the song of the nightingales. Throughout, however, the overall tone, one of ecstatic contemplation, is the same. One of the song's most important unifying elements is the tender repetition of the name "Adelaide." Fidelio, Beethoven's only opera, dates from the heady days of revolutionary idealism, but its cry for freedom has echoed through the centuries. The opera premiered at the Theater an der Wien in November 1805, only days after Napoleon and his army had occupied Vienna. Fidelio seemed to have all the ingredients for success, but the initial performances were a disaster, attended by sparse crowds, which included the composer’s friends and a handful of stray French soldiers. It is best remembered for the Prisoners' Chorus ("O welche Lust" - "O what a joy"), an ode to freedom sung by a chorus of political prisoners, a glorious vocal quartet, Fidelio's magnificent aria "Abscheulicher! Wo eilst du hin?" and Florestan's aria "Gott! Welch Dunkel hier!," which he sings from deep inside a dark dungeon. Fortunately, Beethoven also left us the sinister aria "Ha! Welch ein augenblick," sung by the evil bass-baritone Don Pizarro, who orders that Florestan be killed. 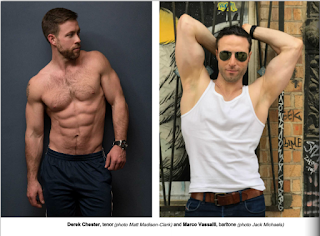 ONLY 15 DAYS LEFT TO ORDER our 2018 Barihunks Calendar, which includes 20 of opera's sexiest men is now available for purchase HERE. In response to reader demand, we've also added a Barihunks Photo Book this year, which includes additional photos that don't appear in the calendar. You can purchase that HERE. The New Year is approaching faster than you think. Watch Christopher Maltman in his 3rd role debut in 46 days! Christopher Maltman is currently performing the role of Mandryka in Richard Strauss' Arabella, which will be live-streamed worldwide. The performance from the Wiener Staatsoper begins at 7 PM (2 PM EST/11 AM PST). He'll be joined in the cast by Kurt Rydl as Graf Waldner, Anna Gabler as Arabella, Chen Reiss as Zdenka and Benjamin Bruns as Matteo. Arabella was the sixth and final collaboration between Strauss and his famous librettist Hugo von Hofmannsthal. It was written during the collapse of the Weimar Republic and given its premiere in Dresden in the first months of the Third Reich. The story revolves around Arabella, a poor little rich girl, looking for the ideal man in Vienna during the declining years of the Austro-Hungarian empire. That man turns out to be Mandryka, but along the way one meets some pretty horrendous family members. Tickets to view the performance can be purchased on the Wiener Staatsoper website. After this production, the company will live stream Mozart's Die Zauberflöte, Johann Strauss' Die Fledermaus and a full cycle of Wagner's Der Ring des Nibelungen. Maltman has been on a whirlwind of late, making three role debuts in 46 days, which included thirteen performances in 3 cities, and sung in three different languages. It started on October 30th with Donizeti's Lucia di Lammermoor at the Royal Opera House in London, and then Frankfurt in November for Verdi's Les Vêpres Sicilienne and finally Arabella in Vienna. 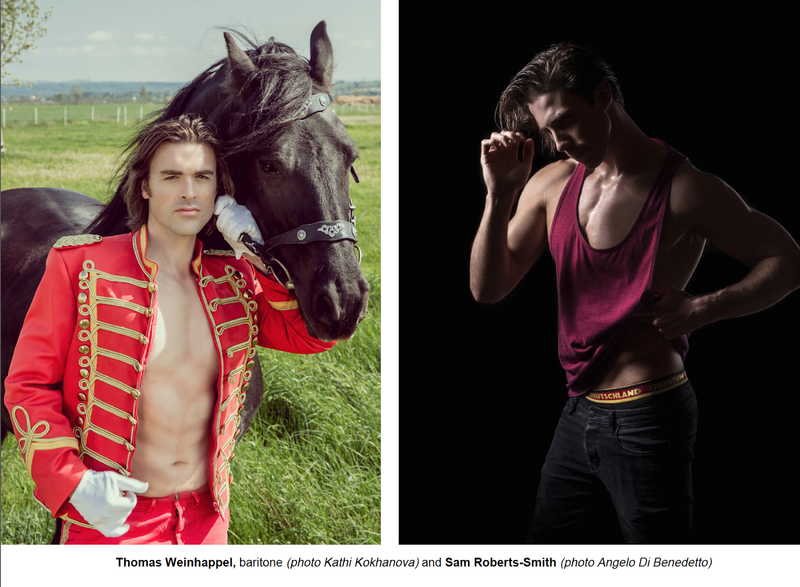 ONLY 16 DAYS LEFT TO ORDER our 2018 Barihunks Calendar, which includes 20 of opera's sexiest men is now available for purchase HERE. In response to reader demand, we've also added a Barihunks Photo Book this year, which includes additional photos that don't appear in the calendar. You can purchase that HERE. The New Year is approaching faster than you think. 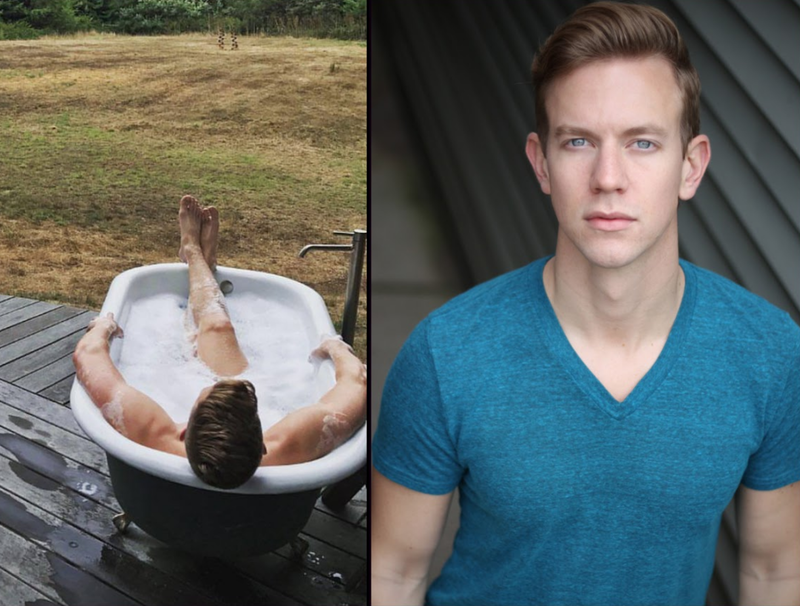 Barihunks Craig Verm and Michael Adams will alternate the role of Guglielmo in Jonathan Miller’s production of Mozart's Così fan tutte at the Seattle Opera. They'll be joined by Kevin Burdette as Don Alfonso and Laura Tatulescu as Despina for all performances, while Ginger Costa-Jackson and Hanna Hipp will alternate as Dorabella, Marina Costa-Jackson and Marjukka Tepponen alternate as Fiordiligi, and Tuomas Katajala and Ben Bliss alternate as Ferrando. Verm will perform on January 13, 17, 24 and 27, while Adams will perform on January 14, 20 and 26. Tickets are available online. After the run, Verm will stay with the Seattle Opera to perform Claudio in Mozart's Beatrice & Benedict, which runs from February 24-March 10. Michael Adams will open tomorrow as the Pilot in Rachel Portman's The Little Prince at the Washington National Opera, which runs from December 14-17. Tickets and additional cast information is available online. The opera is directed by Francesca Zambello. 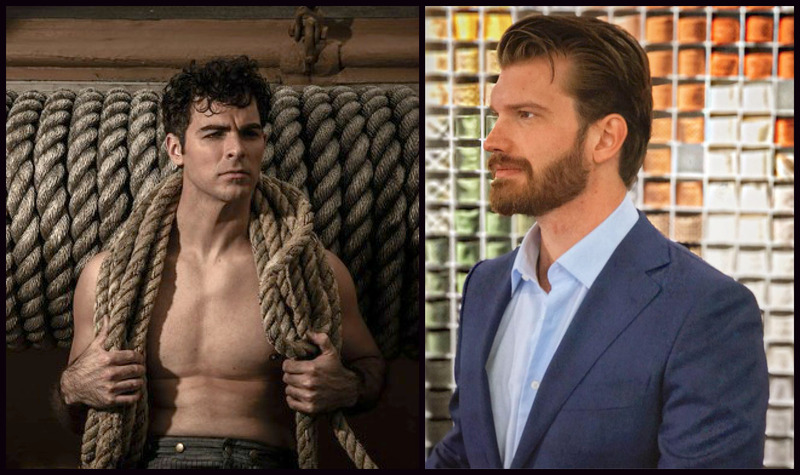 ONLY 18 DAYS LEFT TO ORDER our 2018 Barihunks Calendar, which includes 20 of opera's sexiest men is now available for purchase HERE. In response to reader demand, we've also added a Barihunks Photo Book this year, which includes additional photos that don't appear in the calendar. You can purchase that HERE. The New Year is approaching faster than you think. Gyula Orendt will will be replaced by fellow barihunk Edward Nelson in Ópera de Oviedo's upcoming performances of Debussy's Pelléas et Mélisande. He'll be joined by Andrew Foster-Williams as Golaud, Anne-Catherine Gillet as Mélisande, Maxim Kuzmin-Karavaev as Arkel, Yulia Mennibaeva as Geneviève and Eleonora de la Peña as Yniold. The opera runs from January 28-February 3. Nelson made his European debut at the Norwegian National Opera on April 7th as a replacement in the title role of the same opera. The performance was the first time that the company had performed the opera. Bass-baritone Andrew Bogard, baritone Ethan Simpson and bass Brent Michael Smith all advanced to the next round of the Metropolitan Opera National Council Auditions. Also advancing at the Middle Atlantic Region auditions in Philhadelphia were mezzo-soprano Gillian Cotter, tenor Matthew White, tenor Joshua Blue and soprano Meryl Dominguez. A number of barihunks have recently advanced from the Middle Atlantic Region, including bass Patrick Guetti, bass-baritone Brandon Cedel, baritone Sean Michael Plumb and baritone Elliot Madore. The National Semi-Finals concert will be held on Thursday, April 19, 2018 and the Grand Finals Concert will take place on Sunday, April 29, 2018 in New York City at the Metropolitan Opera House. Bertrand de Billy will conduct this year's concert. Ethan Simpson will be making his movie debut as Cesar in an upcoming film based on Anne Patchett’s New York Times best selling Bel Canto starring Julianne Moore and Ken Watanabe. In January 2018, Andrew Bogard will star as Papageno in Mozart's The Magic Flute at CoOPERAtive in Princeton, New Jersey. In January 2018, Brent Michael Smith will sing Fafner in Wagner's Das Rheingold at the Academy of Vocal Arts. ONLY 22 DAYS LEFT TO ORDER our 2018 Barihunks Calendar, which includes 20 of opera's sexiest men is now available for purchase HERE. In response to reader demand, we've also added a Barihunks Photo Book this year, which includes additional photos that don't appear in the calendar. You can purchase that HERE. The New Year is approaching faster than you think.